What the best time to call? One of the most experienced Bike fitters in the U.K. Fitness and Development which contributes to his bike fit training and experience considerably. 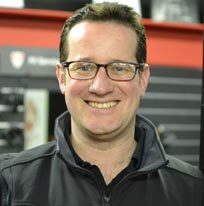 Steve is one of our top bike-fit consultants and comes with a vast background in Road, Time Trail and Triathlon. Steve is a British Cycling Level 3 Road and Time Trial Coach and is also one of the top testers in the Midlands offering a unique understanding of balancing the riders needs to match the events which results in excellent fits offering improved speed, power and efficiency. 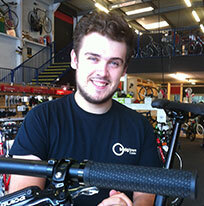 James is our bike-fitter who also has the added bonus of vast Physio expertise. During a Bike-fit our consultants analyse pedal action, foot stability, rider asymmetry, and rider interaction with both the saddle and handlebars. We help each rider understand their interaction with the bike better and also advise them on where they can find improvements from off the bike activity – conditioning, stretching and core work. Who is Bike-fit suitable for? To be brutally honest it is suitable for any level of rider. A poor fitting bike is not the preserve of the new rider. Many very experienced riders have positions that can be improved (sometimes radically). One really interesting fact is that 98% of the Northern European population express Asymmetry (often at the pelvis). Bikes are Symmetrical so our very interaction with the bike is bound to throw up issues. One good way of checking for asymmetry is to look down at your quads/knees when pedalling. Do the legs pass the top tube evenly or is one closer to the top tube than the other? If the answer is yes, one is closer than the other then even if you are not experiencing discomfort when riding a level 2 Bike-fit would open up power that you are currently wasting or not engaging. Just to let you have a progress report. After a couple of weeks I’m now used to my new riding position. It’s very different I feel much smaller and part of the bike rather than sitting on it. Not done a long ride as yet but am completely comfortable after an hour. I now spend 90% of the time on the drops (20% before the fit) moving the levers has made it possible to change gear and brake without needing to change position. With less effort I’m faster than before and my journey to work has gone from about 63 mins to around 58 minutes taking my average speed to over 15mph regularly. I’ve also improved my speed in lots of strava segments. I’m really pleased with the changes and wish I come in ages ago it’s true a good bike fit is a really cost effective way to improve your bike. Thanks again for your help and expertise will be back in touch after a longer ride. Steve. Recently popped in to see Ryan, suffering with pain in my feet during cycling. Ryan suggested a shoe/cleat fitting discussion. Ryan was great to deal with friendly, relaxed, and knowledgeable. Having suggested and implementing cleat realignment I went away to give the new set up a try. The difference has been amazing from a pain factor of 8/10 to now a pain factor of 1/10. Absolutely brilliant Ryan. Many many thanks for your help. Chapeau to you. I have spent the last few days out on the bike and have no discomfort from the bike, comfortable in both positions and no pain in the lower back. I will update again as I do longer distances, greatly appreciate your assistance, cheers! Karl. The ride is much more comfortable … I’m looking forward to racking up the miles. Thanks for your help, Jackie. Since the bike fitting I’ve done nothing but smash PB’s and just took 15 minutes off a ride I did from a month back. Thanks for your help mate. Great service, Adam. Hi Mike, Can I say a big big thank to you, I went out on the bike today , total transformation, like night & day!! Cannot believe the difference it has made. The rest of the lads with be contacting you for a bike fit. Mike you are a magician! Had a fabulous ride – no shoulder/ neck ache and both my legs are peddling!!! I went up one of our local hills like a dream – the friend who I was cycling with was really surprised and then I blatted home – ace! You were a great support, I enjoyed picking your brains being a keen novice unwed to talk to people like you. The ride home on the saddle wasn’t so bad a great improvement on previous. We will catch up soon, Jeff. Thanks loads for this morning. You’re clearly a very experienced bloke in all things cycling and it’s great just to talk to someone who knows what they’re talking about (I find people like that are few and far between!). I’ll definitely be recommending you to my cycling mates who are needing a professional fit or anything else for that matter. I have a long ride on Sunday (badly needed day off tomorrow) so will let you know how I get on. Just having inflated tyres will be a bonus! A big thank you for the bike fit – it feels a lot better in term of the foot position and I could get right down on the drops. I took on board what you said for hills and it really helped today – both the getting up early and in a higher gear to start off with and focussing on different parts of the stroke and then my left leg. We did 45k – one loop of the half ironman we’re doing in July and I was 2mph faster than my previous best average. During all Bike-fits our consultants will offer not only positional expertise but think of your fit as 2,3 or 4 hours with a cycling expert, ask about nutrition, recovery, techniques, pretty much anything we can help you with we will. Level 1 is ideally suited to sports leisure, challenge events, Sportive and mountain bike riders as well as anyone who wants to be comfortable on a road/mountain bike. The fit will be with one of our experienced, qualified fit consultants. Level 2 is suitable for competitive cyclists, long distance riders, those with extreme discomfort, those with multi day events (Lands End to John ‘O’ Groats, London Paris etc). It is also recommended for riders that have feet or saddle discomfort issues when riding long distances. Often these discomforts are associated with rider asymmetry that involves more investigation or input. Level 2 is our most popular fit as it is extremely comprehensive. The fit will be with one of our very experienced, qualified Senior Fit consultants. Level 3 is suitable for anyone undertaking competitive riding on a TT/Tri bike will benefit from this Bike-fit, these bikes are the most rewarding yet least forgiving machines. Alongside this virtually everything that applies to road Bike-fits does not apply to the TT bike, a fact that very few bike fitters understand. We have worked with riders from sub 19minute 10 Mile time trialists to the 1000 mile record holder as well as some of the finest iron man athletes (Male and Female) this country has ever produced. Each rider we work with is unique and we have to build their machines to work with them. On a TT/Tri Bike 5mm can make you or break you. We will discuss aerodynamics – truth and fiction, power output, including analysis where necessary, cadence and right to left output and try to help you with achieving your ambitions, offering advice on nutrition, preparation, training, and how to approach your event. We truly understand the difference between TT & Tri positions. It is regularly noted by our tri clients that the net effect of our work with them is faster bike splits, faster run splits and a large reduction in niggling injuries that prevent effective, consistent training. This fit will be with one of our very experienced, qualified Senior Fit consultants. The purpose of which is to ascertain the level and style of riding undertaken, the current issues involved with riding, including injuries and the ambitions of the rider. We assess saddle engagement making sure the saddle is supportive, comfortable, the correct width and aligned at the correct height and positioned for your needs. In which we will assess your current physical ranges of motion, understand further any injury profiles, past or present and how they may impact on your bike position. When we have you pedalling efficiently and comfortably we will then assess the handlebars, making sure they are the correct width and reach for your range of motion, correctly set-up bars offer you multiple comfortable hand positions allowing you to alleviate any shoulder and neck discomfort. This is a major part of the Bike-fit, get the power delivery base correct and all else can flow from there. Where appropriate video analysis will be used to help the rider understand the differences and the improvements. In our experience rider asymmetry is the causative agent for most saddle discomfort as well as right to left variation in pedal stroke. Asymmetry in the pelvis is prevalent in 98% of us, it is often insignificant in every day activities but fit a symmetrical wedge into the pelvis (saddle) and then the asymmetry comes out in the knee or further down the kinetic chain. In this review we will assess and address these issues. Often this is where the eureka moment happens where suddenly pedalling under load is easy and smooth. In which we will assess your current physical ranges of motion, understand further any injury profiles, past or present and possibly identify areas where improvements can be made with specific exercises. This is a major part of the Bike-fit, get the power delivery base correct and all else can flow from there. We will also undertake a comprehensive foot review so as to best understand what is happening inside the shoe when pedalling and where necessary apply insoles/wedging to provide greater support. ‘Feet are the least understood and most important part of pedalling’. When we have you pedalling efficiently and comfortably we will then assess the handlebars, making sure they are the correct width and reach for your range of motion, correctly set-up bars offer you multiple comfortable hand positions allowing you to alleviate any shoulder and neck discomfort. We will position your bars inline with the riding you undertake whether 1 hour circuit races, classic sportives on the cobbles of Belgium, cyclocross, long road races, enduro MTB races or a mixture of all. In which we will assess your current physical ranges of motion, understand further any injury profiles, past or present and possibly identify areas where improvements can be made with specific exercises. This is critical for improvements in TT/Tri riding. We assess saddle engagement making sure the saddle is supportive, comfortable, the correct width and aligned at the correct height and positioned for your needs. Keeping your hips open and allowing early engagement of the power in the pedal stroke. Video analysis will be used to help the rider understand the differences and the improvements as well as allowing us to make small but often significant interventions and assess their effectiveness. When we have you pedalling efficiently and comfortably we will then assess the handlebars, making sure they are the correct width and reach for your range of motion, correctly set-up bars offer you the ability to maintain an aerodynamic position for sustained periods of time.